Pear OS is a desktop Linux distribution based on Ubuntu, Desktop, but with a desktop appearance fashioned after the Mac OS X UI. A review of the latest edition, Pear OS Linux Panther 3, has already been published on this website (see Pear OS Linux Panther 3 review). 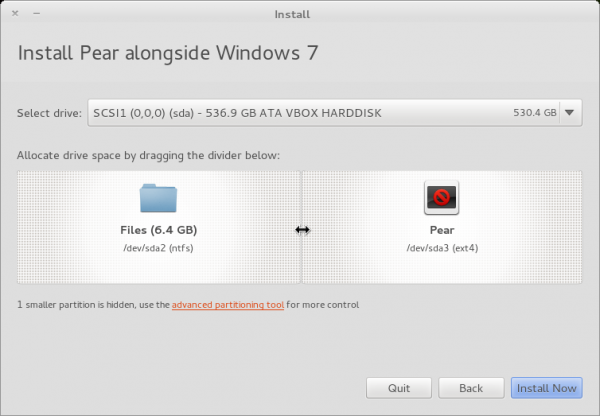 This article presents a step-by-step guide on how to dual-boot Pear OS and Windows 7. To start, you need to download Pear OS Panther 3 from here and burn it to a CD or transfer it to a USB stick. The computer used for this article has a 500 GB hard drive with an existing installation of Windows 7, and it is assumed that you will also be attempting this on a computer that also has an existing installation of Windows 7. 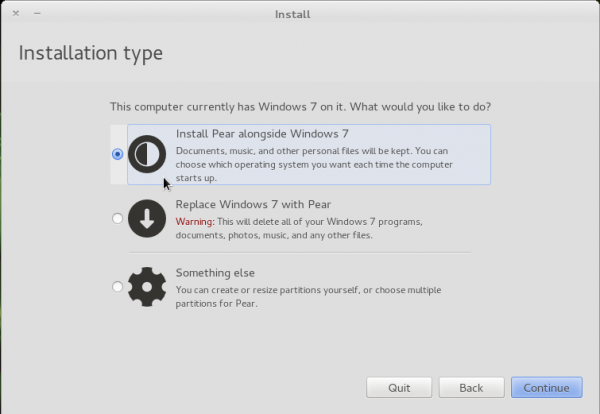 The objective is to install Pear OS alongside Windows 7, so that whenever you reboot the computer, you are given the option to boot into windows 7 or Pear OS. This screen shot show the partitions on the system as seen from Windows 7’s partition manager. Since there is no unpartitioned space left, the only way to install Pear OS alongside Windows 7 is to resize the C drive. That can be done from Windows or while installing Pear OS. For this tutorial, I chose the latter method. Any method you use will produce the same result. The key is to know how much free space is available. You can tell by looking at the “Free Space” column in Windows 7’s partition manager. That should give you an idea of how much space you can recover from Windows 7. 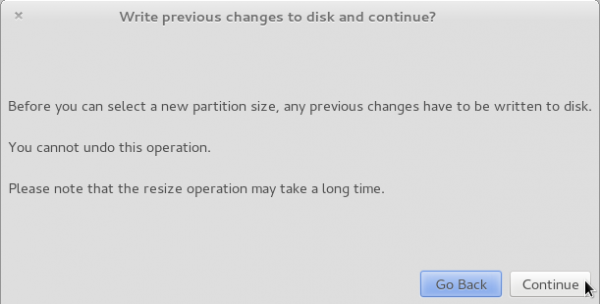 After resizing the Windows partition, you then create those partitions that will be used to install Pear OS. 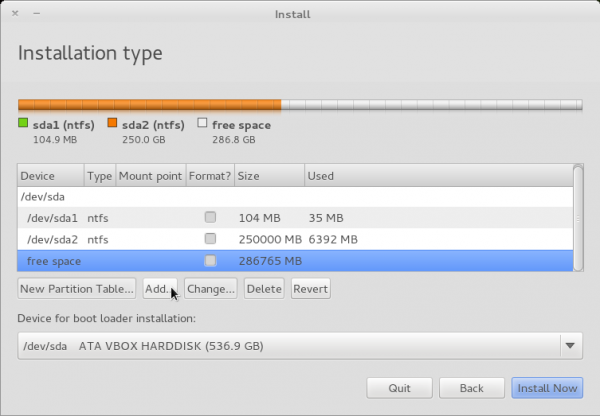 For this tutorial, three partitions will be created from the recovered disk space. They will be mounted at /boot, Swap and /, the root partition. You may also create a separate partition for /home, where your home folder will be located. Related Post: Can Artificial Intelligence be creative? To start, boot the computer with the Pear OS installation CD in the optical drive. 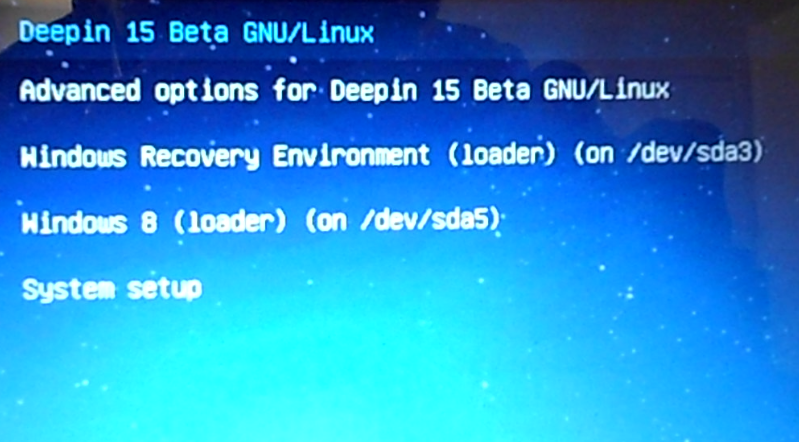 The boot menu is shown below. Though the second option gives the impression that you can boot directly to the installer from the boot menu, selecting the first or second option will actually boot into the Live desktop. From there, click on the “Install Pear OS” on the desktop to begin the installation process. When the installer starts, click through the first two or three steps until you get to the one shown in the image below. Unless you intend to wipe or delete Windows from the hard drive, you will want to avoid the second option. Choosing the first option leads to an automated resizing of the Windows partition, but it does not give you the opportunity to install GRUB, the boot loader, in a location other than the Master Boot Record or MBR. This screen shot shows the step after you choose the first option in the previous step. You can see how much disk space is used by Windows, and you can very easily resize the partition by dragging in between the two sections shown. But since the installer does not give you the opportunity to install the boot loader in a custom location, this is not the best route to take for this type of configuration. So, to continue with this tutorial, you can either click back to the previous page and select the last option – “Something else,” or click on the “advanced partitioning tool” link at this step. Either one brings you to the advanced partitioning tool. The tool is not really advanced in terms of features, it just means that you need a fundamental knowledge of disk partitioning in Linux to use it, or a good tutorial on the subject. 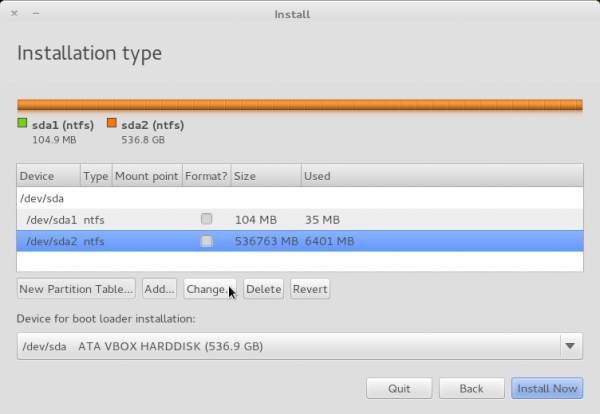 If you are new to this, you might want to read guide to disks and disk partitions in Linux and tips for dual-booting Windows and Linux. So, we already know what the objective is, which is to resize the Windows partition, and create three partitions from the recovered space for Pear OS installation. Note that because Windows has already used up two primary partitions, we only have two left to play with (the system does not allow more than four primary partitions). By using an extended partition, it is possible to create the three partitions that we need. But first things firsts; resize the Windows partition. To do that, select it as shown in this image, and click Change. 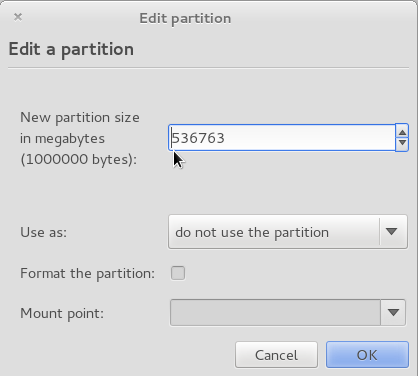 The edit partition window shows the total size of the partition. How much you choose to resize it by, is your decision. For this tutorial, I am splitting it in two; half to Windows 7, half to Pear OS. Here is the same screen after a new size has been specified. OK.
Just a friendly warning. Continue. 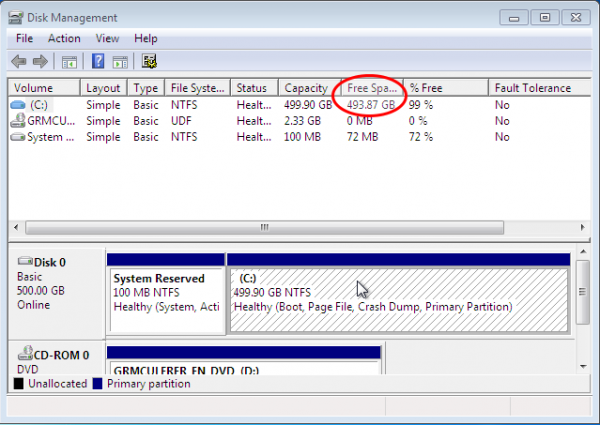 Back to the advanced partitioning tool, you can see the free space that has been recovered from the Windows partition. Time to start creating Pear OS partitions. Select the free space and click Add. 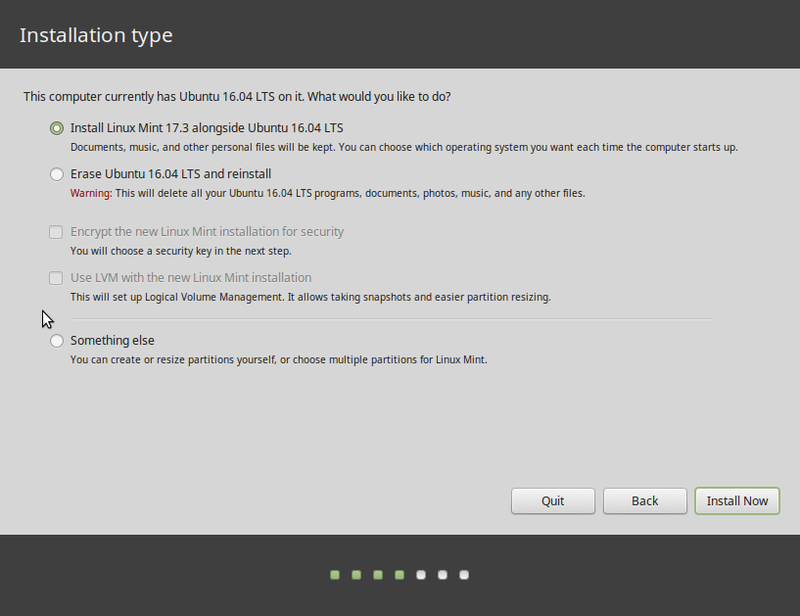 Are you using the latest edition – Pear Linux 5? Never seen that error. Could you describe it in detail? “Pango-WARNING **: error opening config file ‘/root/.panorc’ : Permission denied”.